The dining room at Talk, the Rittenhouse concept from Andrew Kochan and Tim Lanza that shuttered after just five months. Talk, the Rittenhouse restaurant that opened at 2121 Walnut St. just five months ago, has called it quits. 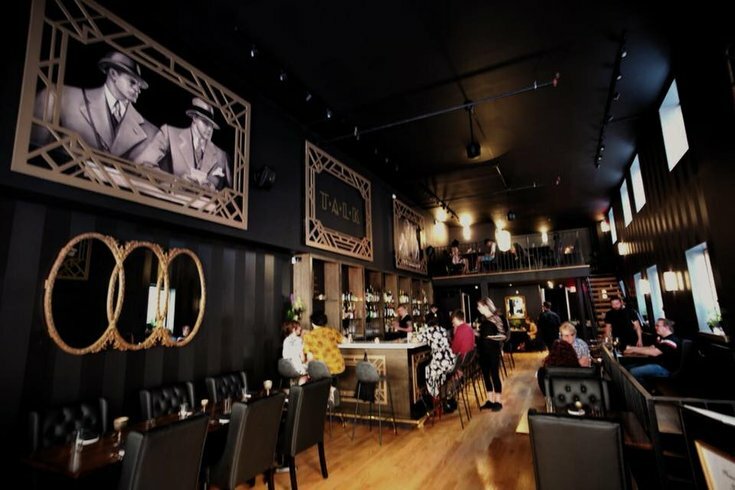 The New American, art-deco style restaurant was a project from Tim Lanza and Andrew Kochan, who previously worked together at Spruce Hill's Marigold Kitchen, for which Lanza was a chef and Kochan was a partner. Esquire names Center City's The Love one of 20 best new restaurants in the U.S.
Talk drew from Marigold Kitchen's nuanced plates but served dishes à la carte, as opposed to Marigold's multi-course, tasting-menu-only service. Though noted for its cocktails and intriguing decor, Talk suffered in part from a few lackluster reviews, as well as an area of Rittenhouse with less foot traffic and dining compared to just a block or two away. Lanza confirmed the news to Philadelphia Magazine, saying he would "take some time to myself to sort out my life and prioritize other things that are important to me." At the time of Talk's opening, Lanza was slated to act as executive chef at both Talk and Marigold Kitchen, floating between the two establishments. Plans for Talk had been in the works for more than a year before opening. Marigold Kitchen is now carrying on with chef Eric Leveillee.